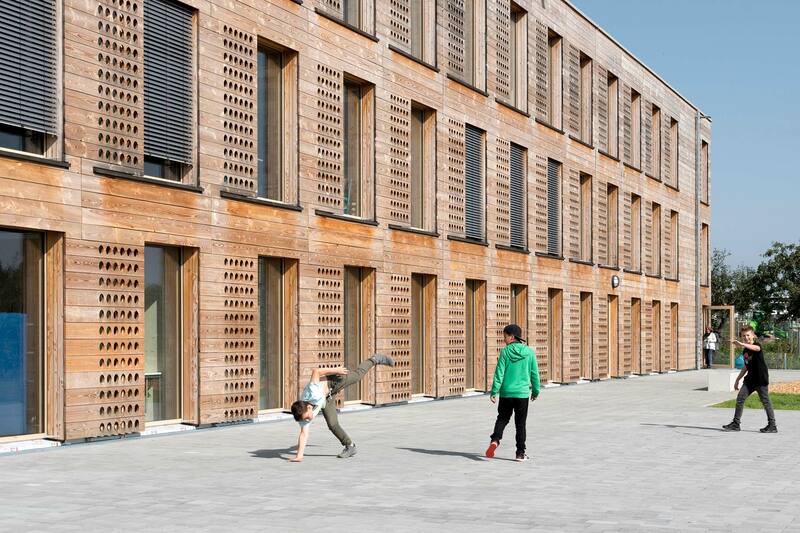 The new erected building for the Integrated Comprehensive School (IGS) Kalbach-Riedberg in Frankfurt was developed as a modular wooden construction, since the project timeline for planning and construction was very short. 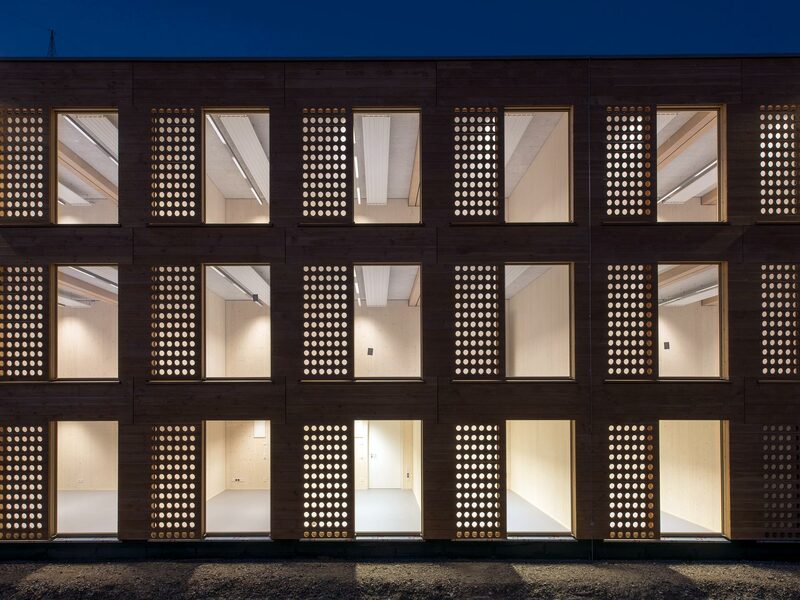 The building consists of 90 modular units each 3 by 7 meter, which were constructed in the workshop of Kaufmann Bausysteme in Austria and then assembled on-site. Transsolar was responsible for the energy consultation and the mandatory energy code compliance certificates. Without aiming for any ambitious energy goals, the opaque building envelope is 50% better than the building code requires, due to the wooden construction with good insulation qualities. With the proposed building design and the environmental friendly local district heating system, the numbers for primary energy demand are 40% below the code requirements. Looking at life cycle assessment, the building will score well, since the building material serves as a carbon storage and the modules can be reused or recycled after end of its lifetime. A special focus in this project was on summer comfort, since the city made some bad experiences with other new school buildings. Therefore, the effect of different shading systems and natural ventilation strategies has been investigated with help of dynamic thermal simulations. Finally, the classrooms are equipped with external operable shading and operable windows for day time ventilation and night flushing, that are burglary and rainwater protected, this wooden protection layer also serves as a fixed shading element. 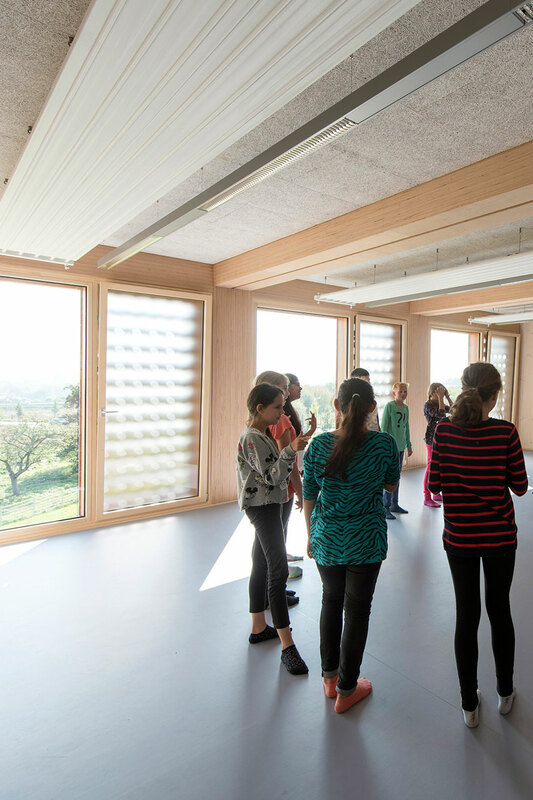 The building is mainly naturally ventilated, Transsolar proposed signal lights inside the classrooms for indicating the demand of fresh air. Only the kitchen is equipped with a mechanical ventilation system with a 90% heat recovery.